The cover of this book claims to teach you “photography secrets from one of the world’s top shooter”, and 256 pages later, I feel that I have definitely gotten an insight into Joe’s work ethic, and understood some of the reasons why the publisher’s suggest he is a “legendary magazine photographer. Joe McNally has been a photographer for over 30 years, and his career has been spent shooting for magazines such as Life, People, Time, Sports Illustrated, and National Geographic. In the first two thirds of the book Joe shares these experiences with the reader. In each double page spread he presents a photograph from his portfolio, and describes, in a casual manner, some of his reasoning behind the shot, and how he achieved it technically. Sometimes this is done by relating to the shot itself, and sometimes by describing a conversation he has had or a situation he has been in, and then illustrating it with a photograph. But either way, it makes entertaining reading. One of Joe’s mantras is “the only good light is available light, and by that I mean any light that is available”, and he really is the master of off camera lighting. For most of the shots he describes how the scene was lit, whether it be a white sheet from the motel he stayed in the night before (“I am a bed sheet thief”) to act as a diffusor on a window, or a combination of softboxes, grids, and snoots. The final third of the book, after a short description of the gear he uses (he is a Nikon shooter, and has shot many advertisements for them, and also made an instructional Nikon lighting DVD called “The Speed of Light” – worth a watch) covers various experiences he has been in, like the time he threw up 50 times whilst shooting a weightless flight at the Russian space camp, or the time he shot 10 frames of a pro baseball player, before realizing he hadn’t advanced his film a single frame. But with each story he illustrates, he always has a message to the reader. One thing that struck me about Joe is that in almost every shot he shows, he has had to work quickly, with high pressure. Typically his subjects give him around 10 minutes to shoot them, and, although he often spends hours before a shoot setting up his concept, he needs to make sure that his shoot works first time, and if not, the reshoot must take place at the same time. You can definitely see shots where he has made mistakes, or where there are visual errors, but that isn’t the point. Keep your eye to the camera at all times, or you will miss a shot, says Joe, and he has stuck true to this. This book is a definite recommendation for anyone who wants to start out in the field of photojournalism, and wants to hear from someone who has been there, done that, but for everyone else, it is an entertaining read, and there is a lot that any photographer can learn from Joe’s musings. New York born Michael Grecco started his career as a photojournalist for the Boston Herald, and worked his way up to become the (self proclaimed) Master of Portrait Photography. He now lives and works in Beverley Hills, on call to many of the rich and famous as their resident celebrity photographer. When you first flick through his book, you may recognise some of the shots from the entertainment press, but although this book is a portfolio of much of his work, Michael has written it with the intention of providing portrait photographers, from beginners to advanced, with a technical resource book. The first three chapters cover the camera, illumination, and the medium. The ‘camera’ chapter, and the ‘medium’ chapter (basically covering analog vs digital, and color palettes) don’t really introduce much new, although they do set the scene quite well, but the chapter covering illumination really sets this book apart from many others on the same subject. The book is approx 30cm square format, and each double page spread in the illumination chapter is devoted to a full page photograph, together with half a page of text explaining how the photograph was made, and half a page lighting diagram. So although the average reader is unlikely to have access to the same level of model that Michael does (the page on hard lighting is accompagnied by a photograph of Kate Winslet, and the page on high speed strobes by Jet Li….) at least he will have some ideas on how to replicate the same lighting situation with his own resources. 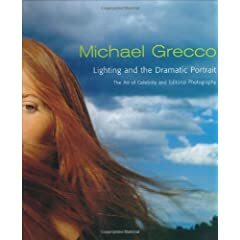 This is something that I have found sadly lacking from many other books on lighting, and something I am sure I will refer back to in future when working in the studio. But joking aside, he does make some very helpful suggestions about how to go about designing and visualising a picture, and in the following chapter, ‘The connection’ talks about the best ways to build up a relationshop between the model and the photographer. The final third of the book is filled up with case studies, in which Grecco introduces more images from his collection, and talks about the way he made each shot. The book is just short of 200 pages, softcover, but printed on high quality glossy paper, and written in an easy to follow language. This is a great book for anyone interested in getting some new ideas in portrait photography, and also for those who want to see a high quality collection of celebrity images, but what really made the book for me was the presentation of and the story behind the images, combined with the technical details and set ups that he had used. I purchased this book on a recent trip to the US after reading recommendations from fellow photographers on the Strobist Blog. The title, “Skin: The Complete Guide to Digitally Lighting, Photographing, and Retouching Faces and Bodies” should give you an idea of what goes on between the covers, and this was the reason that I had purchased the book – I wanted to know a little bit more about using the digital medium to photograph people. However, if this was all I was expecting, I was in for a pleasant surprise – the author, Lee Varis, has been working as a Hollywood photographer for over three decades, and in this time has seen many changes in the way photographers work. He was early in embracing the new digital medium, and used his first digital camera setup already in 1990. So with this book he has aimed to share some of the knowledge gained in 15 years as a digital people photographer with his reader. I found his writing style easy to read and understand, and the book approached the subject in a well structured manner, starting off with chapters on ‘digital imaging basics’ and ‘color management, workflow and calibration’, before moving on to more in depth topics such as ‘lighting and photographing people’, introducing some new techniques that I hadn’t thought about before along the way. But chapters 4 to 8 are where the real fun starts. His approach is to go through a detailed look at many of the Photoshop features that relate to people photography, together with examples and exercises (a companion CD accompagnies the book). Although the examples he uses are specifically related to people, I found that the information I learnt has helped me in general regarding my use of Photoshop – the chapter on ‘Tone and Contrast: Color and B+W’ is an excellent look at different ways the individual channels play a role in both color and black and white imagery (I have already put many of these techniques into play in my b+w conversions), and the section on ‘The Color of Skin’, which basically explains contrast, tone, and the advanced use of curves, also provides a much needed overview of this genre. Furthermore, Lee covers in some detail image retouching, and final print preparation, including a detailed methodology behind image sharpening. I would recommend this book to any medium to advanced Photoshop users, especially those working with portrait and fashion photography, although as I said, all of the techniques can be applied outside of the realm of ‘skin’ photography.